Prime Minister Voreqe Bainimarama has reminded Police Officers that the badges they wear is not a decoration nor are they a free pass to operate beyond the scope of the law. He made these comments while opening the new Valelevu Police Station. 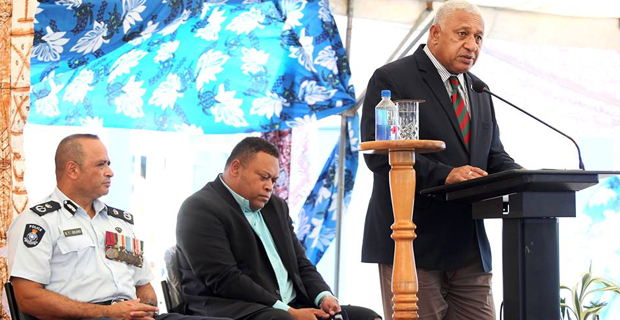 Bainimarama says as officers of the law, they must serve all people equally, regardless of their background, ethnicity, religion, gender or social status, physical or mental condition – whether they are wealthy or poor. He says he receives complaints about the poor attitude of some police officers and some are much more serious, citing corruption among officers and other violations of our laws. Bainimarama says while these transgressions are a serious concern, they do not define the force adding that his Government recognises the great work many officers carry out everyday and they are committed to supporting that work in every way possible.